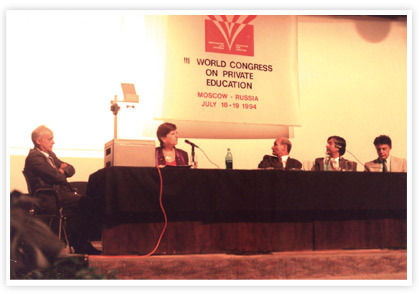 The III World Congress on Private Education was held in Moscow, capital of the Russian Federation, on July 18th and 19th 1994. Its motto was: ''Education for freedom." COMED, together with the Minister of Education of the Russian Federation, tried to emphasize the importance acquired by Eastern European Nations in the field of private education development from the time of the democratic opening generated in those countries. As it had happened in the previous events, Ministers and Officers of Education, UNESCO representatives, Deans from different universities, professors and leaders of educational entities from the five continents attended the meeting. Once the sessions had finished, the Executive Committee of COMED had a meeting with the participation of four Russian representatives: two of them were incorporated to the leading organism of the Confederation as Directors for Eastern Europe: Eduard Dnéprov and Vladimir Tijomirov. As a conclusion to the work done during the Congress, COMED approved the "Moscow Declaration." 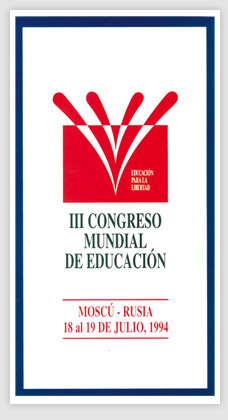 The representatives of the Organizations and the Regional, National and Continental Associations of the World Confederation of Private Education, COMED, gathered in Moscow on the 18th and 19th of July, 1994 to, bring the main conclusions of the III World Congress on Education for the consideration of all States, Governments and people of Nations, and proclaim in their Moscow Declaration the main statements for Education in and for Freedom. 1. Freedom comes with life. 2. The struggle for the liberty of teaching and learning is the struggle for man's liberty and his total development. 3. Liberty to teach leads to the right of creating, planning and running educational centers. 4. Liberty of learning presupposes free choice of the educational pattern. Both liberties are based on the inalienable right of students and their families to education. 5. The principle of liberty to teach and learn supposes the coexistence of state and private schools, as well as the right to access and attend any school. 6. The States and Governments are only the managers, not the owners of their peoples resources. 7. They must, therefore, manage responsibly the revenues they collect, that is to say, with the maximum of efficiency and profit for society and their citizens. 8. True justice demands from the States and Governments that they should be, at the same time, judges and defendants at the moment of fixing the criteria for the application of their resources to students. 9. In consequence, the resources destined to students in private schools should be the same as the actual cost of state teaching. 10. The principles of distributive justice and free choice of the educative centers recommend the consignation of public funds directly to students of private schools and their families. 11. The fiscal exemption of educational expenses of students from families who pay directly the private centers not subsidized with public funds is the minimum demanded formula of social justice. 12. The contributions of society to education, investigation and culture will have the incentive of fiscal exemptions. 13. The comparative index of education expenses is, without any doubt, one of the most efficient measurements of the progress of different countries, societies and peoples. 14. The advancement and progress of private teaching centers, in all levels, are proportionally related to their organization as true educative enterprises. 15. Education is not an expense, but the best investment. 16. From Moscow, the present symbol of human aspiration to freedom. COMED renews its pledge of permanent cooperation with public and private organizations for the spreading and excellence of education in all Nations of the World. 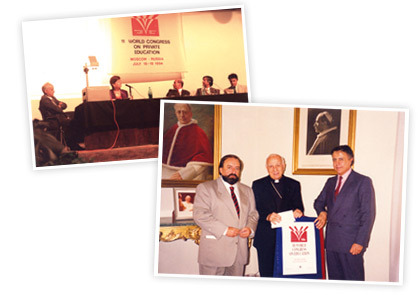 DR. EDGARDO DE VINCENZI, PRESIDENT OF COMED WITH DR. JOSÉ AURELIO DE CAMARGO, VICEPRESIDENT OF COMED TOGETHER WITH MONSEÑOR PÍO LAGHI WHO BLESSED THE ADVERTISEMENT OF THE WORLD CONGRESS. MOMENTS OF THE CONGRESS (HELD AT THE CONVENTION PALACE IN MOSCOW) IN WHICH PERSONALITIES SUCH AS MIJAIL GORBACHOV AND BORIS YELSIN PARTICIPATED. Eugeny Tkachenko (Minister of Education of Russia) with the President and Vice-president for Latin America of COMED, at the closing ceremony of the World Congress (Moscow, July 1994).